Discussion in 'Albion Online General Discussion' started by Stratics News, Apr 15, 2019. 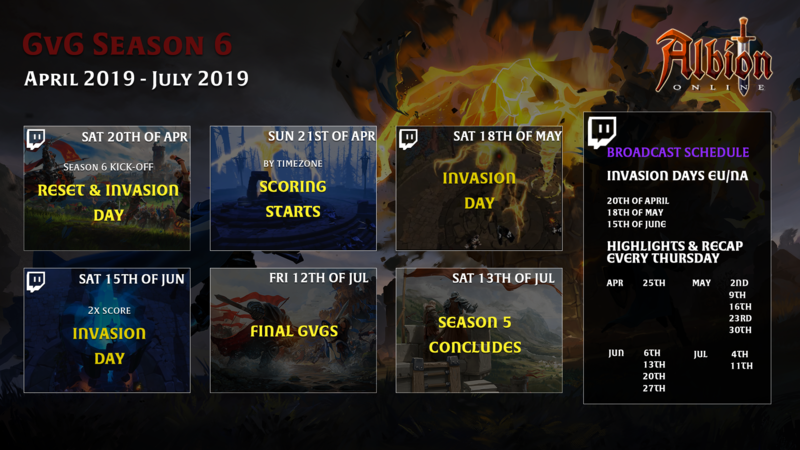 Albion's sixth season of guild-versus-guild warfare kicks off this Saturday. As always, winning teams can claim powerful exclusive rewards, including the epic new Battle Eagle mount. While its exact stats, abilities, and appearance are still a work in progress, the Battle Eagle will offer its rider unique skills that will be useful to support allies in various combat and scouting settings. This mount will be awarded to guilds who reach Silver rank or higher during Season 6, with additional rewards given to all guilds who reach Iron rank or higher. We'll be covering Saturday's Invasion Day action live on the AlbionTV Twitch channel. Tune in Saturday at 17:00 UTC with hosts Lewpac and Shozen as they introduce the start of the season. At 18:00 UTC, the season officially begins, and guilds can claim territories and launch attacks. For the complete season schedule, check out this forum post. Remember, you can also tune in every Thursday at 18:00 UTC for highlights from the previous week.